Ever since the basic medical insurance system was established in 1999, urban residents in China have had to endure unpleasant hospital experiences. Top hospitals in capital cities are usually crammed with patients, their symptoms varying from a slight cough to the most unusual diseases. A lot of time is spent waiting to get an appointment, to see a doctor or to pay a bill. On the other hand, the primary health care system is losing patients. Statistics show that of the 30,000 hospitals nationwide, tertiary hospitals (which are first-grade in the rating system) account for only 7 percent, but also account for 50 percent of outpatient visits and 44 percent of inpatient visits. Gu Jing is a doctor working at the Sijiqing community health service center in Hangzhou’s Jianggan District, one of thousands of publicly funded community health care service providers in China. After seeing 54 patients one morning, she checks her phone during lunch and finds several enquiries in her WeChat patient groups. A mom asked: “My baby seems to be bitten by something. The swollen area turned into a small blister. Should I do anything?” A picture is enclosed. Gu tells her not to worry and, if things get worse, to try erythromycin ointment to avoid infection. 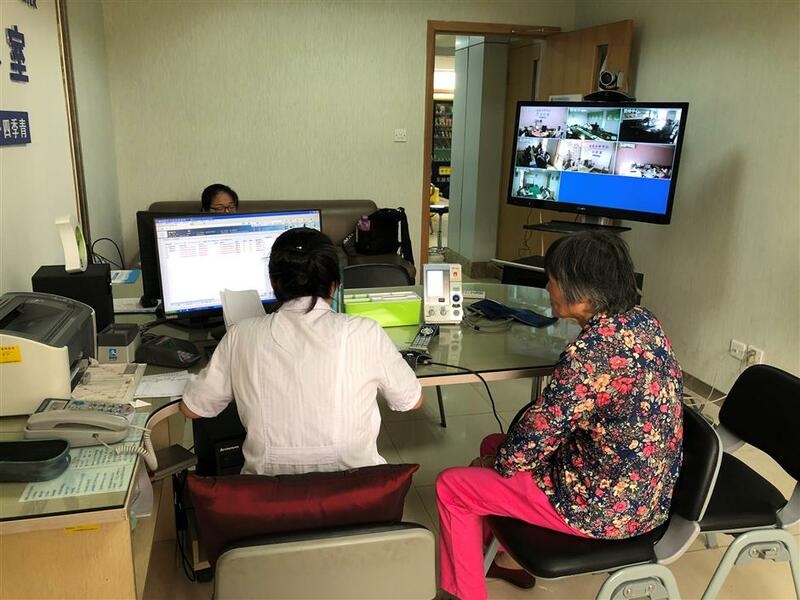 A general practitioner checks the medical profile of a patient at a clinic room which is equipped with remote medical consultation in the Sijiqing community health service center in Hangzhou. “I have eight such WeChat groups, each with no more than 100 people. As their family doctor, I communicate with my patients in this way,” said Gu. The family doctor program was launched in 2014 at the center as a way to improve services and attract more patients. People who sign a one-year contract with their family doctors pay 1 yuan (15 US cents) a month and enjoy a higher health insurance reimbursement ratio than those who have not. This year so far, 1,430 patients in the neighborhood have signed up with Gu. Of those, 44 percent have chronic diseases such as diabetes and hypertension. Apart from working her regular clinic hours, Gu is also in charge of setting up health profiles for these patients and offering health care advice. The profile is a digital database which includes everything from age and family disease history to previous medical records. People suffering from chronic diseases or immobility may apply for a hospital bed and related equipment at home. The family doctor visits them twice a week. These patients may also have free and more efficient transfers to upper-level hospitals if necessary. The 300 yuan in their health insurance is exempted if the transfer is done through the family doctor. “We would like to offer additional services for these people,” said Li Zusheng, vice head of the Sijiqing center. He said people who signed up had 24-hour phone access to their family doctor. Also, a service line deals with basic enquiries and technical problems. Last year, the center recorded 304,947 outpatient visits, an 5.8 percent increase on the previous year. At present, there are 50 general practitioners like Gu working in the center. This year they are serving 18,141 residents in the area, just over 40 percent of the total resident population. His view is that the general practitioner model is more suitable for most ailments. There are eight such health service centers and 64 smaller service stations in the district, each just a 15-minute walk from residential areas, and technology has stepped in to help streamline medical treatment procedures. Every clinic room is equipped with a payment terminal accepting both health insurance card and mobile payments so patients do not need to queue at a separate checkout. Results of medical tests done at any hospital can be accessed via text messages, WeChat messages or an independent app. Also, by collaborating with local pharmacies, the Sijiqing center is able to deliver prescription medicine free for those enrolled in the family doctor program. At the same time, the multi-trillion-dollar medical care industry is attracting Internet companies and venture capital. Weimai, a Hangzhou-based Internet company, is using big data and artificial intelligence to digitize medical procedures and establish a network across different level hospitals. By downloading its app, users can make appointments, pay medical bills, check medical results and make general enquiries with online doctors. Weimai has signed contracts with local governments to serve all hospitals in their areas. Its service now covers 150 million people in more than 70, mainly smaller, cities across China. The data they acquire allows them to understand patients’ demands more accurately. “Actually medical resources in China are not in shortage, but imbalanced,” said Qiu Jialin, founder and CEO of Weimai. Although medical resources in China are still not entirely open to the private sector. Qiu is optimistic about the future. “It’s changing. Once the reform begins, it’s never reversible. There will be great opportunities for entrepreneurs,” Qiu said. • In September an agreement was signed between Shanghai and seven cities in the region — Nantong, Yancheng and Xuzhou in Jiangsu Province, Jiaxing and Ningbo in Zhejiang Province and Chuzhou and Ma’anshan in Anhui Province. Shanghai residents working in these places are able to use their health insurance card directly in city-level hospitals and also provincial-level hospitals in Zhejiang. • In July, an academic consortium of medical and healthcare management for the Yangtze River Delta was launched in Jiangbei New Area in Nanjing. The consortium was initiated by medical schools and business schools at Nanjing University and Zhejiang University, with academic support from China Europe International Business School in Shanghai. It hopes to boost communication between academic experts, policy-makers and business leaders in the medical and healthcare industry in the region.